Combining electrical properties with synthetic scaffolds such as hydrogels is an attractive approach for the design of the ideal synthetic soft tissue, one that mimics the architecture of the native extracellular matrix and provides the electronic functionality needed for cell–cell communication. Conducting polymers (CPs) are carbon-based polymers that are electronically active and consequently are being investigated as the structural material for fabrication of electroactive hydrogels. CPs are attractive in that they could be processed in various forms, their chemistry could be modified to introduce different functionalities and most important is their capability to conduct electrons. 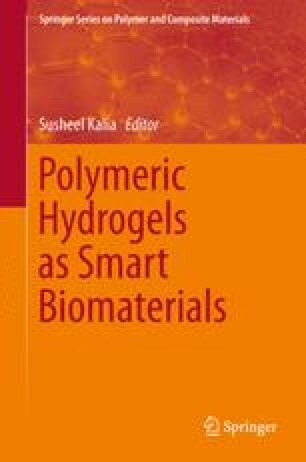 In this chapter, electroconductive hydrogels (ECHs) fabricated from CP either as a single component or as an additive to conventional hydrogel networks are reviewed. D.M. would like to acknowledge the Marie Curie International Incoming Fellowship for financial support. G.G.W. acknowledges the support of an ARC Australian Laureate Fellowship.